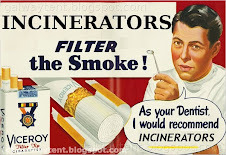 "Naked deception is perfectly legal in Ireland"
Ireland's legal system, from the point of view of an honest discussion on incineration, is a threat. Ireland's legal system, from the point of view of international investors, is a joke. The promoters of the Poolbeg Incinerator seem to be steeped in Ireland's culture of legal deception. Postulated examples of this are here (a). This deception may cause one hundred thousand man-years of reduced life expectancy. There is no way to be sure as the promoters seem to be curious as regards to protecting the public interest. An explanation of Ireland's culture of deception is here: Credibility shredded by mess of Anglo Irish. In January 2009 The Financial Times called Ireland a banana republic. The description in 2005 by the New York Times of Dublin as “the Wild West of European finance” was widely revived. The full text is posted in the first comment to this blog posting. 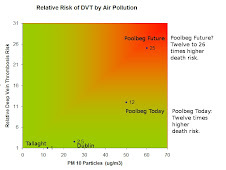 Poolbeg Incinerator - April 2007. (a) Check all facts yourself and then form your own opinion. TO UNDERSTAND the scale of the Anglo Irish Bank debacle, and the consequent necessity for a change of government, it is necessary to return to a column I wrote after the revelation a month ago of Seán FitzPatrick’s systematic concealment of his huge loans. I was, nevertheless, wrong to call Brian Lenihan a liar. This was an unfair slur on his personal integrity. A lie is a deliberate untruth. I’ve since learned that Brian Lenihan’s misstatement was accidental. After he finished his interview, his officials told him he was wrong and he immediately apologised to the presenter, Cathal MacCoille. I had assumed that Brian Lenihan was lying for one reason – it seemed inconceivable that he had not read the statement issued in his name by his department on an issue as sensitive as the crisis in Anglo Irish. Yet, he seems in fact to have had only a vague idea of what that statement contained. He did not know that the official government response to FitzPatrick’s gigantic scam on his bank’s shareholders was that it was “disappointing”. That pathetic response is one of the key reasons why the Irish public, now and for generations to come, has found itself saddled with the consequences of a collapse of trust in the Irish banking system. In the context of the global crisis, the revelation that FitzPatrick and some of his fellow directors were treating Anglo Irish as a personal playground was always going to do huge damage to Ireland’s international reputation. The only way to limit that damage was for the Government to distance both itself and the rest of the Irish banking system from FitzPatrick and his cronies. A clear, absolute and angry condemnation, followed by swift legal action, was not just an ethical necessity. It was a financial imperative. The message that went out to the world was thus absolutely clear: FitzPatrick’s behaviour, and that of his fellow directors, is perfectly okay in Ireland. It may be regarded as a bit disappointing or inappropriate, but there is nothing in Irish law, in our system of financial regulation, or in our culture of business getting done between friends, to prevent massive, systemic deception of shareholders about the true nature of a major firm’s accounts. There were two possible conclusions that any rational investor could have drawn. One was that cooking the books is illegal, but that the authorities were rushing to protect a well-got banker with strong connections to the ruling party. The other was that naked deception is perfectly legal in Ireland and that you can’t trust any accounts published here. It is not easy to say which conclusion is more damaging, but either way the consequences were bound to be disastrous. And they were. 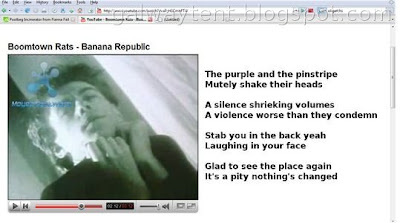 The Independentnewspaper of London reported: “Analysts were also stunned that the practice was not illegal in Ireland.” The Financial Timescalled Ireland a banana republic. The description in 2005 by the New York Timesof Dublin as “the Wild West of European finance” was widely revived. Whatever shred of credibility the Irish banking system still had was torn apart. The nationalisation of Anglo Irish, with a potential doubling of the national debt, became inevitable. We have to understand that the “reputational damage” that has caused this crisis is not merely to the banks – it is to our entire system of governance. Once the Government locked itself in, apparently by accident, to the message that FitzPatrick broke no laws, our legal system became, from the point of view of international investors, a joke. We need to act very quickly to stop this rot and send out a message of change. On the anniversary of the first Dáil, Fianna Fáil and Fine Gael, who share an analysis of the crisis, need to form a unified government, leaving Labour, which does not share that analysis, to lead a coherent opposition.